We can all feel the weather getting warmer, stormier, scarier; and we can all see it becoming dirtier too, on land and especially in the sea – and we have no one to blame but ourselves. For some obscure reason, humans have attached themselves to their many belongings, finding most things “necessary” for our survival. At the same time we embrace permanency, yet we readily throw objects away as soon as they are broken or not-so-new anymore. Sometimes it appears that we do not know what we want, though if it is shiny we’ll take it! The scales have gone up and down with the accumulation and purging of stuff, and for a long time now, balance has been lost. We wish for, want more, we ask for too much – more than the Earth has to give sustainably. Of course, we can take it all and leave none for tomorrow, though if you’ve ever gone hungry from running out of food, you know this anti-wisdom is not a good practice. It is good to have reserves, savings. Not necessarily in monetary terms, nor in collections of random objects, but in skills and meaningful experiences. Once upon a time, I was born into the fast-paced consumer culture race. At an early age, I questioned why I needed 20 presents, yet I didn’t get the one thing that I asked for. More stuff was better than the single item that cost more. As an eco-minimalist, I see the same problem with that misguided notion today, just as it perplexed my growing conscience back then. Not all minimalists live in tiny houses and not all minimalists wear sustainable wardrobes; they may be capsule wardrobes – but is that going far enough to address a changing climate? What if your small set of clothes were handmade (not fast fashion) with love from all sustainable materials that are entirely plastic-free? Would it feel strange to get rid of all synthetic materials that keep us warm and dry, for the sake of reducing microplastics in the oceans? Could you wear all organic cotton, hemp and naturally tanned leather with pride, no labels or sweatshop strings attached? Minimalists are people, like anyone and everyone else, who must still consume to survive. 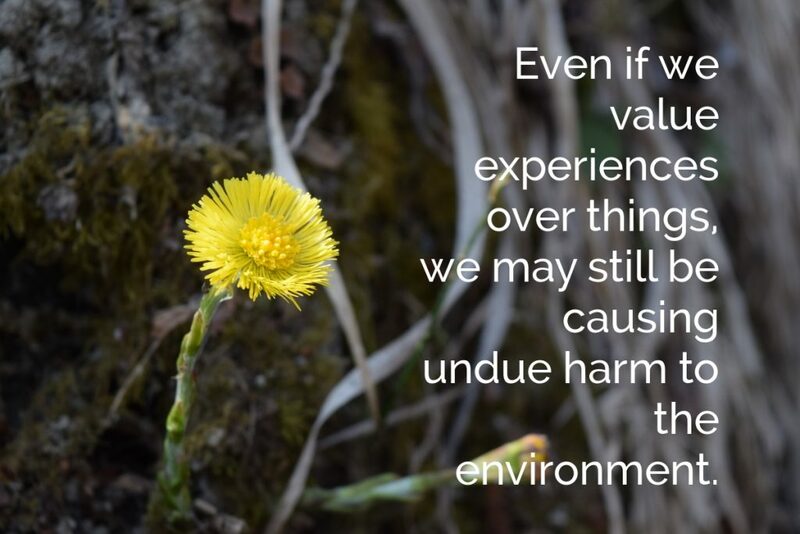 Even if we value experiences over things, we may still be causing undue harm to the environment. If you love to travel and fly where your heart desires to go, you are racking up airline miles, along with raising your carbon emissions sky high. If you spend your free time playing games online, or listening to your stored music in the cloud, then you are consuming electricity 24 hours a day. Take a moment to think about how that power to play is being produced. If you are utilizing renewable energy, then you are on the right track, if not, know there are ways that even minimalists can reduce their carbon footprints. Your mode of transportation creates a large impact on climate change and global warming. Do you own one car in the family, or two? Do you carpool, ride the bus or train, or do you cycle or walk to work? Can you work from home and skip the stressful commute altogether? How willing are you to get outside of your comfort zone and change your situation? What you eat and how much you cook at home speaks volumes about your carbon footprint. Too many grains supports an unbalanced monoculture that relies heavily on subsidies and herb-insect-pest-icides. Most fish contain plastic and the demand for palm oil is ruining the orangutans’ habitat – their home, not yours. We’ll skip the meat debate, though I will mention in passing that grass-fed animals are part of a healthy and nourishing diet. The closer you can eat to home or, better yet, grow your own, the more prosperous we all will be. Start eating a place-based diet, it is the next big thing. Skip the food transportation, reduce your food miles and eat locally to sustain the land around you. While you are outdoors, bathing in a forest on your digital detox day, consider the trees – and how there could be millions, even billions, more of them. Examine your carbon footprint once again and figure out how many trees would it cost to offset your every breath, then go outside (or have someone do it for you) and plant trees, much more than what you need! Finding balance in nature is a give and take situation, not give or take, so let’s be mindful and choose our words carefully. When we respect every object, every creature, every being, only then will the scale level out. And as the focus shifts from we to they, realize that every purchase made, creates an impact somewhere else in the world. Even minimalists are affecting climate change, but we have an advantage as we’ve already left the heavy baggage behind. Now we can go plastic-free and zero-waste with ease, leaving no clutter in our wake. Cheryl Magyar is a freelance writer and green living coach who helps families and introverts return to simpler ways of sustainable life. Follow her homesteading adventures in rural Romania on Instagram.